The Costa Brava is a place full of life and natural richness, with great diversity of fauna and flora. The diver may encounter moonfishes, barracudas, conger eels and morays, great banks of two-banded sea breams and damselfish, gilthead, imperial breams, lobsters, nudibranchs ... and in winter, monkfishes and Zeus faber fishes. There are dives for all diving levels. 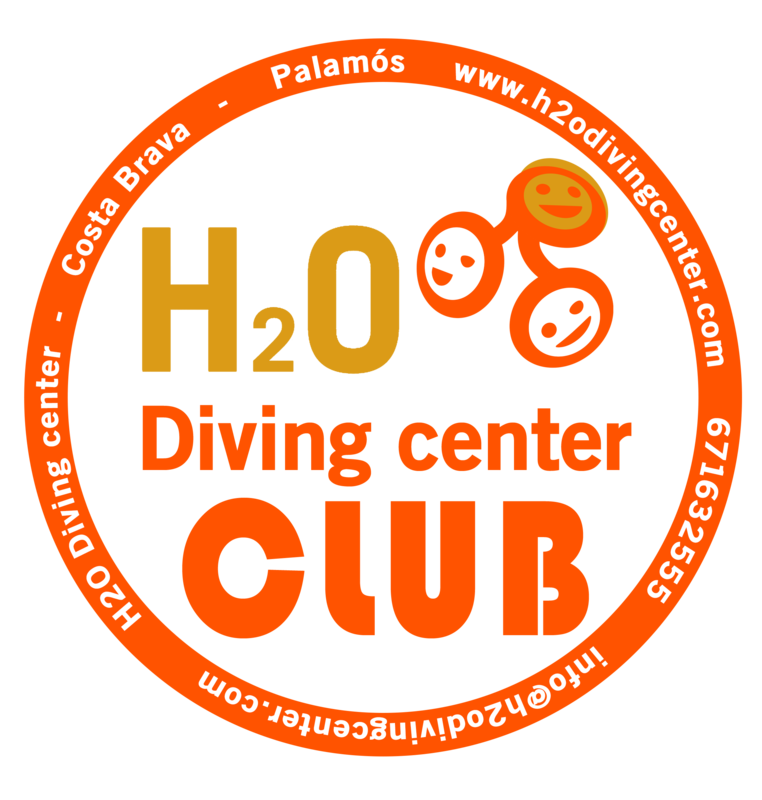 Dive sites with maximum depths of 20m, with good visibility and easy orientation, for those who are starting in diving or want to perform a low difficulty dive. 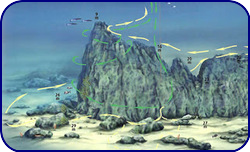 And dive points with more depth, in caves or wrecks, for advanced divers or those who want to realize technical dives. Just in front of Port Salvi, in the dive area of ​​“Punta de Garbí”, between Les Planetes and Cala del Vigatà, there are the caves or tunnels of Sant Feliu. In this area we will find three submarine tunnels of great beauty and easy access that we can cross with total ease and security. During the dive, we will encounter moray eels, lobsters, scorpion fishes, octopus, groupers and even some lobsters. 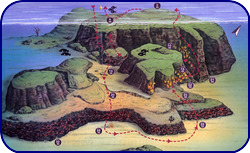 The bottom is formed by large rock formations, tunnels and wide channels. Located in front of Platja d'Aro, we find this majestic rock. If we descend by the cape and sail to the North we will gain depth until we reach walls full of gorgonians and lots of octopus. If we follow the path always with the wall to our right we will ascend slowly along the back of the rock enjoying a great immersion full of life with a placid and easy route. The Boreas, which original name was Pellworn, was a German tugboat built in 1938 that participated in II World War. In 1980, it was acquired by a Panamanian society and re-named as "BOREAS". After a dark period, the Spanish Customs Police captured it by smuggling off the coast of Begur. 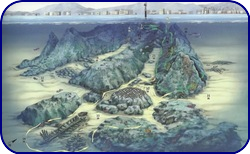 After several years abandoned in the port of Palamós, it was acquired by two dive centres, which with the relevant permits, sank it purposely into the area of ​​"La Llosa de Palamós" in 1989, where it rests at 32 meters deep creating an artificial reef that all divers enjoy. 10 minutes of navigation from Port Marina of Palamós, we found (find o found?) this fantastic dive site. Ideal for all types of levels, from OWD to the most advanced. In this enclave, we will find small canyons between the rocks, walls full of life, and if we are attentive, most likely we will see some barracuda hunting. 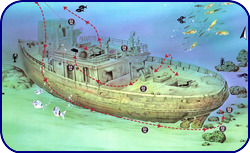 If we sail to the SE, we will find the remains of the Cairo wreck, which rests at a depth of about 34 meters. 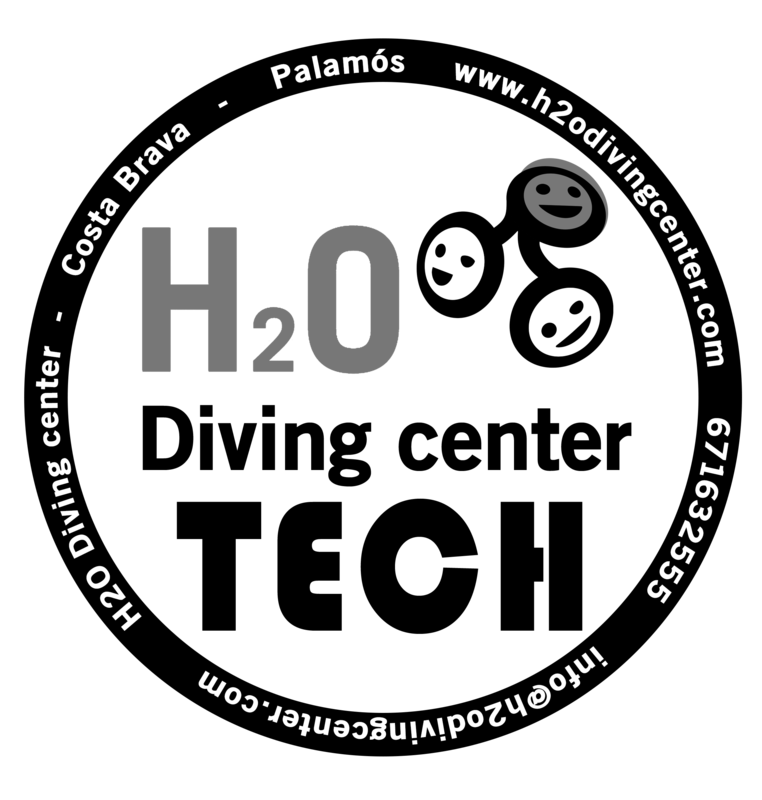 A few minutes of navigation from Port Marina in Palamós, we have this ideal dive point for OWD divers due to their simplicity and adequate depth. The “Llosa of Pere Grau” is located just at the beginning of the fishing port pier. It is a wall of rock that initially has its bottom at about 7 meters deep but that as it moves away from the coast it can reach up to 15 meters. 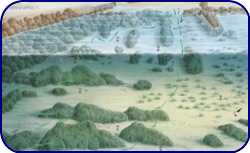 But do not be fooled, “Llosa of Pere Grau” hides a lot of treasures like the posidonia prairies, a multitude of octopuses and morays. Immersion located next to the port of Port Marina in Palamós. 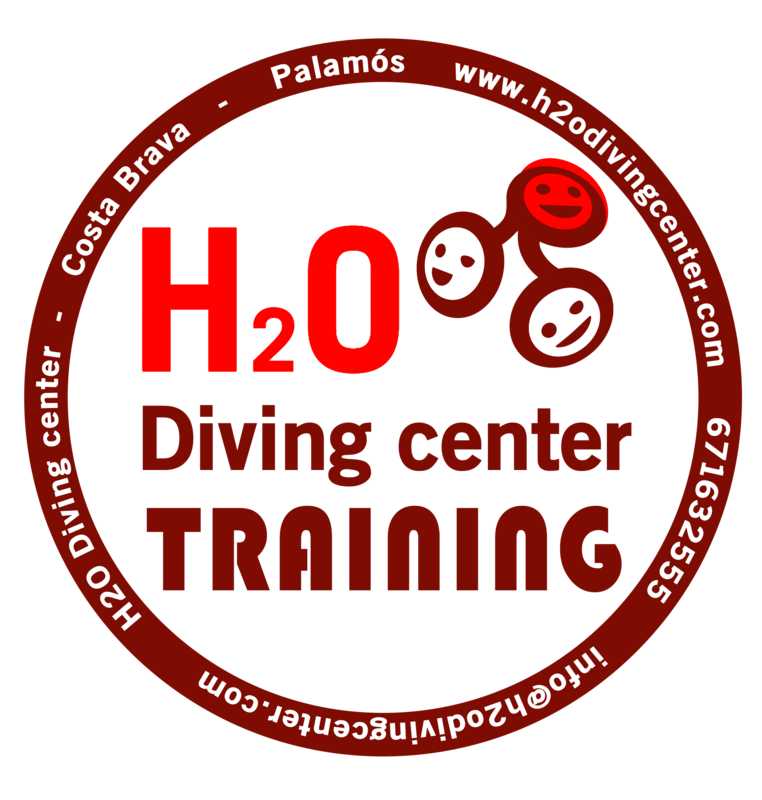 It is perfect for a first contact with the underwater world and for those who are in an early stage of diving. 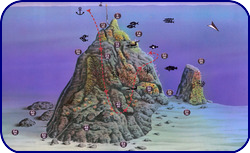 For the more advanced divers, we can find fantastic places like the Bethlehem, the Rose of the Winds or the Anchors. All of them are different dives that will never make you tired of the creek. 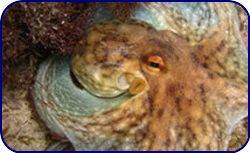 It will be easy to enjoy the company of octopuses, morays and some conger. If we go into it at night almost certainly we will witness a visit of some squid. Located very close to Port Marina in Palamós, we find a cozy creek and with a very special charm due to the type of houses present, fisherman style and built on the beachfront. Access to water can be made from a rocky creek that offers no problem at all or from boat. It is a simple dive. 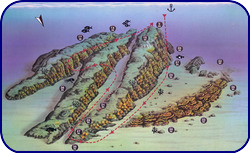 The route to follow must maintain the rock formations of the Cap Gros to our left. Based on its characteristics, it is perfect for beginners and lovers of photography. 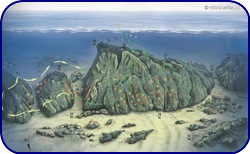 We will be able to enjoy posidonia, rocks, banks of sea breams, octopuses, conger eels and morays. Lifetime! This is the perfect definition of this small reserve formed by a group of islets in front of the Cap de Planes, between Palamós and Calella de Palafrugell. 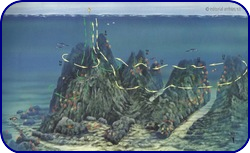 Upon immersion, if we head NE direction, we will enter a series of canyons full of gorgonia and if we descend a little more, it will not be difficult to find lobsters, octopuses, morays and multitude of nudibranchs. 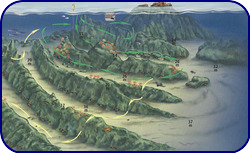 If we set SW heading we will find a broad contrast of lights and wider canyons ideal for OWD divers. Located almost in front and less than two miles from the port of Llafranc, we find three fantastic underwater mountains called Els Ullastres. These are three rock formations that are completely submerged. 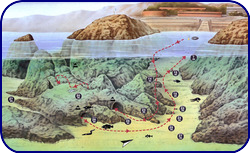 The Ullastres I is the one that is nearer the coast and begins at about 10m deep and descends until the 30m. On most of its slopes, we can observe a large amount of gorgonians as well as the typical fauna of the area (conger eels, morays, lobsters, nudibranchs) and, easily, the passage of some barracudas. Located almost in front and less than two miles from the port of Llafranc, we find three fantastic underwater mountains called Els Ullastres. These are three rock formations that are completely submerged. The Ullastres II is the mountain that is in the middle of the three Ullastres and starts from 8m deep and descends to 35m deep, with soft slopes and isolated rocks in the background, forming caves and narrow corridors. In this dive abounds the walls of gorgonians, banks of barracudas as well as lobsters. It can be done as a circular route or following the cannons that guard it. Located almost in front and less than two miles from the port of Llafranc, we find three fantastic underwater mountains called Els Ullastres. These are three rock formations that are completely submerged. 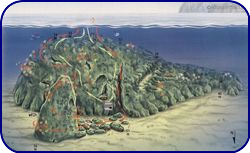 The Ullastres III is the submarine mountain farthest from the coast of Llafranc, its highest part is about 8m deep and descends until 54m. The almost vertical descent of its north wall, full of large gorgonians, will offer us a unique spectacle. We can see red and yellow gorgonians, conger eels, morays and lobsters. At an approximate distance of half a mile, in line perpendicular to the coast of the village of Tamariu, there is one of the most beautiful submarine profiles of our coasts. Two gorges that run between three rocky walls of unequaled attractiveness oriented to the northeast and that starts from 9m deep, where we find located the buoy of anchorage, and they will take us to beyond 40m. 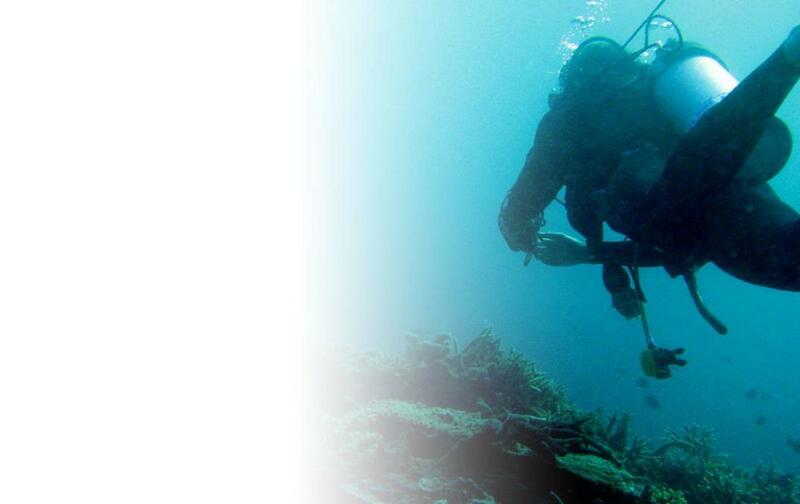 We can observe gorgonians, sea breams, lobsters and grouper. If we are in the cove of Aigua Xelida, and in the direction of Punta es Mut, we direct our view towards the east, we can see an islet that emerges from the water which is the top of a rocky underwater formation called Furió d'Aigua Xelida. The main attraction of this dive is the rock formations that we will encounter during the entire dive, such as canyons, sand corridors, majestic walls, tunnels lined with sponges and other geographical features. Half a mile north of the cape of Begur is Furió Fitó, one of the most impressive underwater rock formations on the Mediterranean coast. 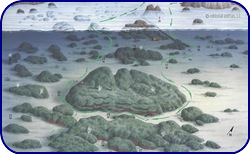 It is a huge submerged massif, which begins at 13m deep and has its base beyond 56m. If we descend on the side of the large Furió, we will see large numbers of gorgonians and local fauna (groupers, barracudas, lobsters, etc.). If we venture to the small Furió it will be easy to discover great conger eels and morays.